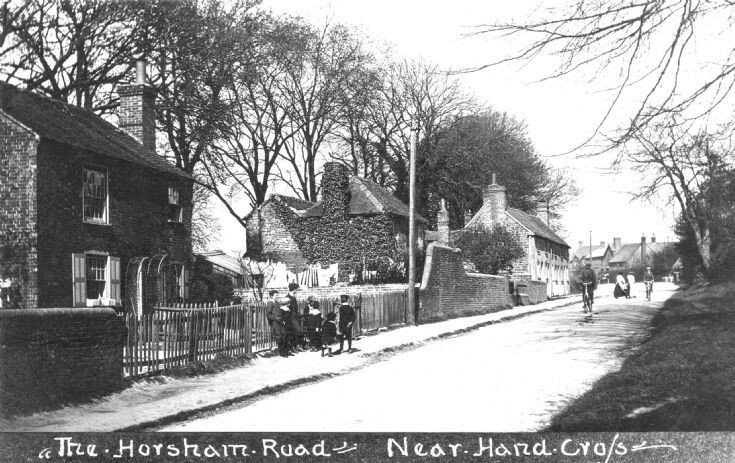 On the left are Prestons Cottages, a pair of semi-detached cottages, built by the Preston family of Slaugham Park. In later years an extension was added to the far side, and recently they have been converted to become one detached residence named Kilmenys. Between Kilmenys and the creeper-covered Laurel Cottage the entrance road to the new housing estate of Truggers was created soon after WWII. Laurel Cottage used to operate a laundry business and certainly the washing line is full of various items including several dark-coloured stockings. Seven young lads are gathered on the pavement, with, refreshingly, not a mobile telephone to be seen. There is some activity where the bridge will eventually be built, and in the far distance there seems to be an early car parked outside Hillbury Cottage. Click on Open Document for a view of the main protagonists. KIlmenys was once my house between 1995 and 2011. I spent time looking at the ancient deeds and know the pair of cottages were built between 1807 and 1842, as a plot of land appeared in 1807 and by 1842 the house was there. But I never knew when. One of the pair was originally called Wheatwood.